John Champneys, a wealthy American rice planter of Charleston in South Carolina has the honor of the first introduction of the Chinese gene for perennial flowering to our Western roses. In about 1802 he fertilized Rosa moschata with pollen of ‘Parson’s Pink China’, which he had received through the brothers Noisette from France. The result was an attractive hybrid, that combined the climbing habit, large open clusters of flowers and odour of the Musk with the semi-double flowers of the China and the handsome foliage of both. Champneys called it R. moschata hybrida, but the rose became such a great favourite in America, that it came to be known as ‘Champneys’ Pink Cluster’ or ‘Champneys’ Rose’. A few years later, Philippe Noisette sowed seeds of Champneys’ hybrid and thus in the second generation raised the original French Noisette rose. This rose quickly became a very popular garden rose and was figured by Redouté in 1821 under the name of R. Noisettiana. 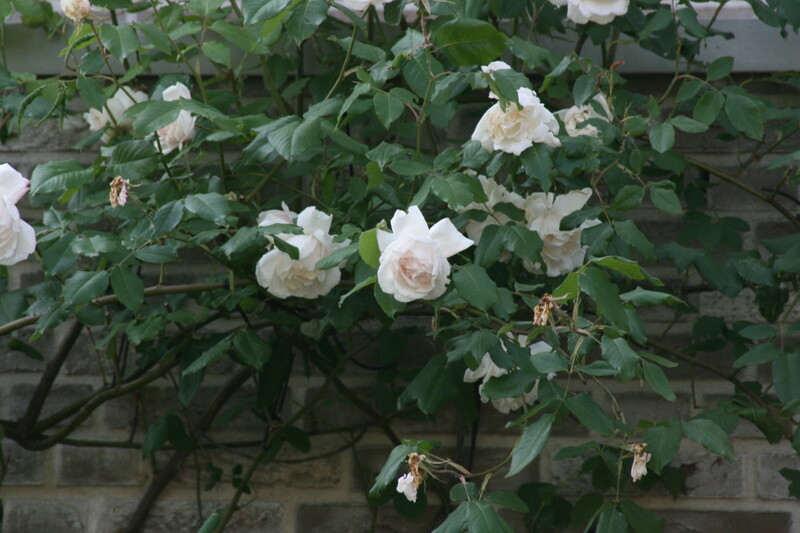 The second generation Noisette Roses were less tall and more compact in growth than Champneys’ hybrid; the flowers were blush-white, born in large dense clusters, equally fragrant, but above all, they were produced continuously from June to the first winter frosts. Up to 1830 there was little variation in the Noisette race bred from seed, but around that time attempts were made to create a yellow Noisette by crossing ‘Blush Noisette’ with ‘Parks’ new Yellow China’, with the far-reaching result that it gave rise not only to the Yellow Noisette, but also to the Yellow Tea roses. The scent of the Noisette Roses is pleasantly spicy and also the leaves have a typical spicy fragrance. The development and popularity of the Noisette Roses runs almost parallel to that of the Bourbon and Tea Roses, but the most important development was that these roses added the color yellow in the color spectrum of the climbing and rambler roses. Noisette Roses are slightly less hardy than the older rose varieties, but can tolerate more frost than you might suspect. Apart from that, and their somewhat susceptibility to mildew on poorer soils and sheltered places they are particularly easy garden roses.